When I was twelve years old, I found a book while digging through the spider infested boxes in our garage. It was called 100 hikes in the South Cascades and Olympics by Harvey Manning and Ira Spring. 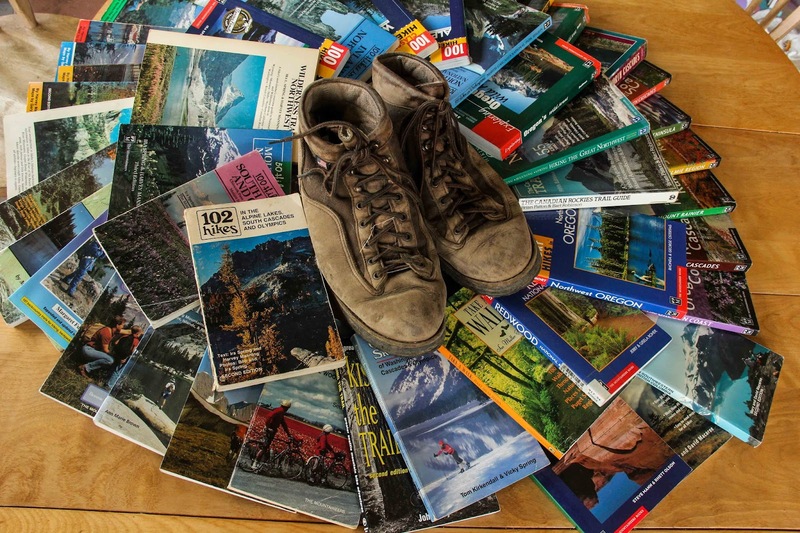 Ten years later, my collection has expanded to over 70 books covering trails in every corner of the mountains of the West Coast. One of my projects during the long dreary months of this winter was to move all my books from a sagging, overburdened shelf to a new set of shelves. In the process, I realized that just as these books shaped the shelf, they have shaped many aspects of my life. I was drawn into 100 Hikes, at first, by Ira Spring’s incredible photography. The photos brought to mind scenes from The Lord of the Rings: a photo of High Rock Lookout perched atop precipitous cliffs, Flapjack Lakes, placid beneath the menacing crags of Sawtooth Ridge. Peaks and lakes, alpine tundra and ancient forests – all reminded me of the fantastic lands where heroes trod. I would read Harvey Manning’s descriptions and stare at the marvelous places recorded there, imagining my own epic journeys into the wilderness. As I put the last of my hiking books onto their new shelves, one tumbles to the floor. It happens to fall open to a page featuring a panorama of the Alpine Lakes Peaks: Summit Chief, Mt. Daniel, Mt.Hinman, their craggy heights rising over a small lake glittering in a verdant forest valley. It strikes me that summer isn’t very far away, and maybe it’s time to start planning this year’s hikes. Soon the shelves are empty once again and books are strewn around me in a haphazard circle; my portal to the mountain kingdoms, currently still locked in the icy grip of winter. In my mind the flowers are already pushing their way up through the snow drifts, their scent already welling up from beneath the deep powder blanketing the meadows. I fancy I can hear the snow melting from here……. 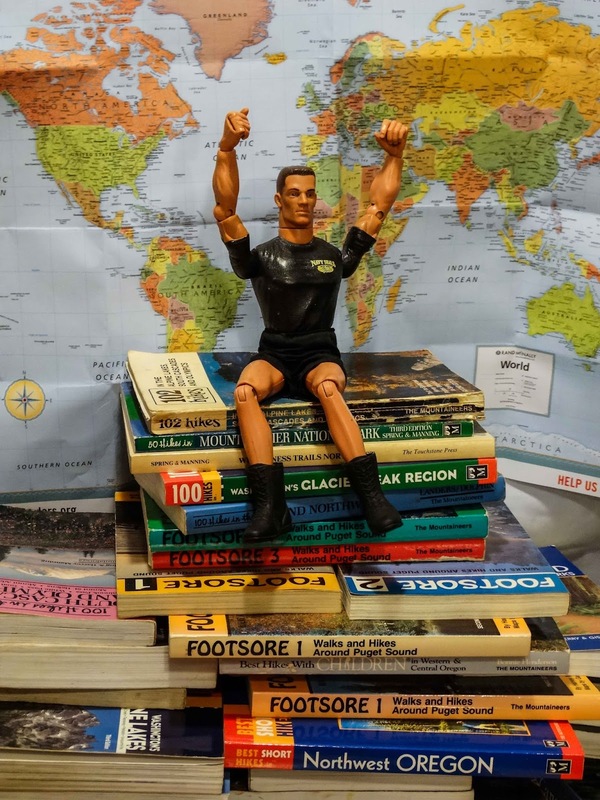 GI Joe scales a mountain of literature! [i] McManus P, (1978). A fine and pleasant misery. New York: Henry Holt & company. PG. 2. [ii] Manning H. (1998). 100 Classic Hikes in Washington. Seattle WA: The Mountaineers. PG. 11. [iii] Manning H. (1998). 100 Classic Hikes in Washington. Seattle WA: The Mountaineers. PG. 11. [iv] Manning H. (1985). 100 Hikes in the South Cascades and Olympics. Seattle WA: The Mountaineers. PG. 79. Andy, your blogs continue to amaze me! This one is great, too...good topic. Snow at last in the Mt. St. Helens High Country.